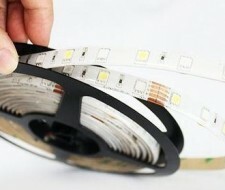 Revolutionary RGBW LED ribbon with a kelvin specific white element giving a true white - warm white, natural white or cool white! This allows for full colour change along with a excellent quality white light. The incredibly bright Epistar 5050 LED 4 chip together with the versatile LED strip allows for stunning and creative effects. The ribbon has 3M adhesive tape on the reverse and it can be easily cut every 3 LEDs (12V) 6 LEDs (24V) to fit any application. Available IP20 by the metre or IP66 on 5m reels. We can supply a selection of 24V transformers to suit your installation and a four channel colour controller for full operation. Please call our sales team on 01492 233002 for assistance.